Shangri-La is the quintessential Maine lake house. The drive down the sun-speckled lane transforms you, relaxes and prepares you for just the kind of vacation you have been so looking forward to. Travel down a winding lane with tall pines opening on a newly renovated cottage sitting so close to the water’s edge, a stone dropped out the living room window would land amongst the lily pads. 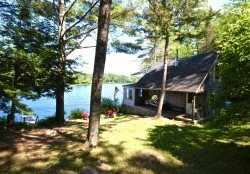 This cottage was one of the first to be built on Crawford Pond (really a lake, but known locally as such) and, according to the owners, has always been known as Shangri-La. The recent and full renovation didn’t alter the charm of the original design – but thoughtful upgrades have made this cottage more comfortable for modern living. With two bedrooms, 1 bathroom with a full sized washer and dryer, a modern kitchen, WIFI and cable TV Shangri-La has everything you need and all the things you don’t. You’ll hear loons all day long, the occasional boat (this is a private lake so boat traffic is limited), the dipping of a paddle as a kayaker passes by and the water lapping the shore. The first floor has a fantastic covered porch overlooking the yard and the waterfront. With plenty of comfortable seating, this is a great place to read, take a nap, have coffee in the morning or a glass of wine as the day settles down. The kitchen has a gas stove and oven, a full-sized refrigerator, dishwasher and a microwave. It is fully equipped with a large amount of counter space, ready to prepare meals of any size. Outside on the deck is a propane grill as well. The dining area seats 4 -6 people and is open to the living room. The front of the cottage is all windows and regardless of where you are, it’s hard to tell that there is any land between you and the lake. The living room has a large, flat screen television with cable connection. Upstairs, the master is at the front of the cottage with a queen bed. The windows offer unobstructed views of the lake and have blackout shades to block the early morning summer sun. Thoughtful elements like bedside table with good reading lamps, a full-length mirror and closet space make a difference. The bathroom is located between the two bedrooms and is clean. modern and efficient with a shower, vanity and a stacked washer and dryer. The second bedroom is at the back of the cottage, overlooking the wooded back yard. With two twins, a bureau and a closet there is plenty of room to move around. The waterfront is lovely and friendly with a dock. The water level gradually gets deeper and this is a great place to launch a kayak from. Off the dock is a float with built in lounge chairs…an easy swim from the end of the dock. While peace and quiet abound here, the large cities of Rockland and Camden and towns like Tenants Harbor, Port Clyde and Owls Head are a 15-minute drive away and day trips to Bar Harbor, Boothbay, Portland are convenient. House water is fine for washing. NOT for DRINKING. You will want to bring drinking water.